The European Union and its promise of a mobile, well-educated youth improving their world might be looking tattered these days. 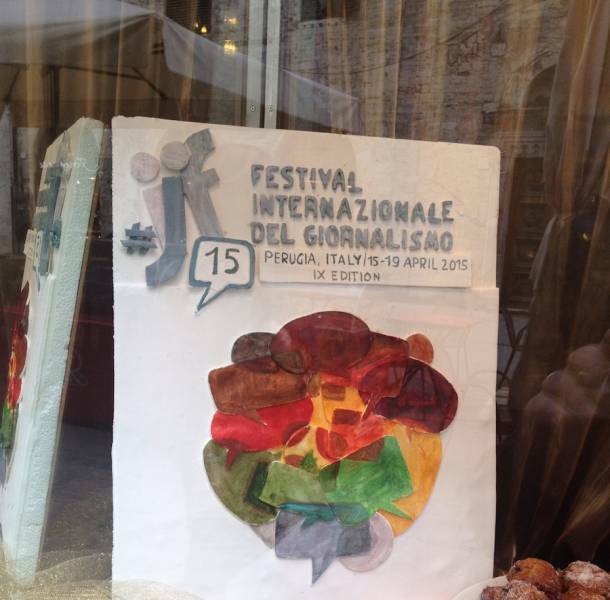 But the battered image got a little boost this week in Perugia, the Umbrian capital and university town. For a few days every spring the ancient Etruscan city feels like the center of the global media universe rather than the capital of a small, landlocked region (I like to think of Umbria as the Italian version of Vermont). Journalists from around the globe gather for the International Festival of Journalism (journalismfestival.com), where they watch documentaries, listen to debates and get some hands on lessons and inspiration from some of the greats. This year’s edition, however, seemed fully immersed in the global village that media in all its forms has become. 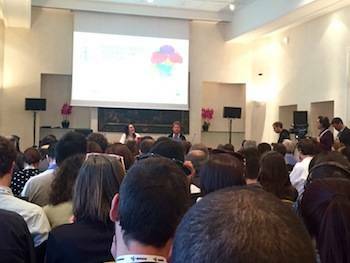 One completely unscientific sign of Italian assimilation into the English language-dominated EU: Organizers give out translation radio-headphones to select events. In earlier years, there would typically be a rush for the headsets. This year, not so much; anecdotally at least, the young and media-savvy listened to speakers unaided. Previous years have also seen disputes over the festival’s funding and venue. The organizers, Arianna Ciccone and Christopher Potter originally called off last year’s edition, saying it had gotten too big and too expensive. There were hints that Perugia might not be so supportive, if not from them, then from the gossip on the street and online. 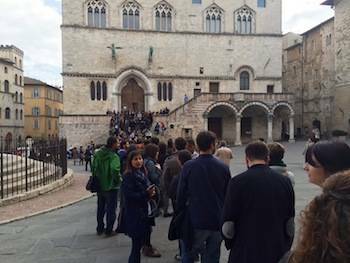 Rumors circulated that the venue—Perugia—might be changed. It looked dire for awhile, until Ciccone and Potter relented. But there was a condition: They crowdfunded the festival, with an understanding that unless they reached €100,000, the show wouldn’t go on. With the help of thousands of contributors and a few companies, the goal was surpassed and the festival went on. This year, the organizers reverted to sponsor funding. Geek warning: Though there wasn’t as much Italian introspection on display at the festival, there was plenty of inside baseball of the journalism kind, as you might expect. IJF15 Central is the Brufani Palace Hotel, central Perugia’s finest. A lot of speakers are put up there, and they might even have time to splash around in the hotel’s pool, which features a glass bottom view of the ancient ruins under the hotel. Local (though owned by Nestlé) chocolate maker Perugina was represented, too, by giant bowls of its famous Baci, which fueled the sometimes frenzied networking and session attendances of the crowd. But back to the substance—or, perhaps, process? Media people everywhere are obsessed with the move online. It’s nothing new, of course, but the audience has suddenly shifted seismically in the past couple of years. And it’s not enough, attendees were told again and again in different forums, to merely put online what you’d do on paper or before the camera. One panel was titled “Tech vs. 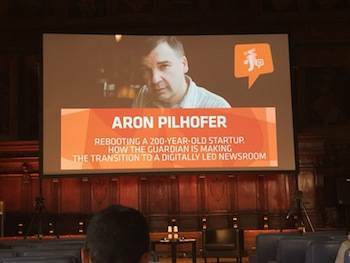 Journalism: Who’s in Control?” The very first speaker, moderator Vivian Schiller of Vocativ, delivered a spoiler at the start: Tech is. The kid was one of many who warned about the dangers of machines controlling our lives. But the big show had to be Edward Snowden. People lined up way in advance in the central Piazza IV Novembre for a chance to see the spying whistleblower and the filmmaker who documented his emergence, Laura Poitros, in the beautifully ornate Sala dei Notari. They didn’t appear in person. Snowden isn’t free to leave Russia and Poitros keeps a low profile, so they appeared (of course!) via Skype. Snowden was both in good humor and deadly serious. He walked the crowd through how the U.S. National Security Agency (NSA) spies on people worldwide. But more than that, he gave an eloquent argument why it’s wrong. Besides the obvious invasion of privacy, the NSA’s spying has given more authoritarian governments, like China’s, license to do the same—and worse. They keep their citizens behind almost impenetrable firewalls, and launch attacks against other governments and companies around the world—the old “if they do it, why shouldn’t we?” argument. Lest it sound all serious and dire, along came La Stampa editor Mario Calabresi to lighten the mood. At one point, he quipped that Italians are so down these days because, post-Berlusconi, they don’t have a fixed object at which to direct their negativity.) 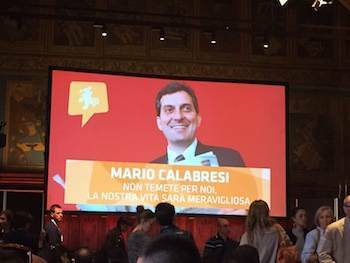 Also speaking in the Sala dei Notari, which is reserved for the big draws, he talked about reinvention and serendipity. Putting a spin on an intractable problem, he told anecdotes about unemployed young people suddenly reviving old family enterprises and improving them. Sure, Calabresi was there to push his book, Non temete per noi, la nostra vita sarà meravigliosa: Storie di ragazzi che non hanno avuto paura di diventare grandi (Don’t worry about us, our life will be terrific: Stories of youths who aren’t afraid to become great), but his chat gave a human touch to a festival that can be dominated by business concerns and theoretical arguments.